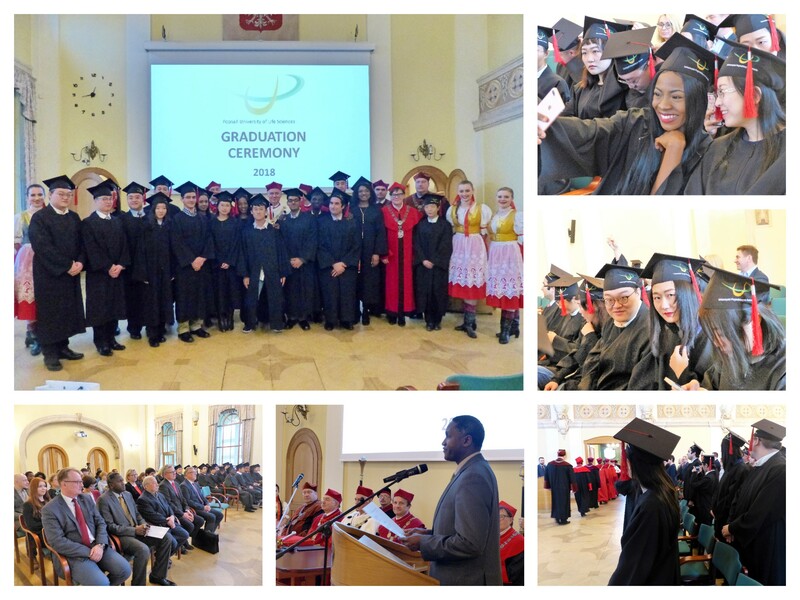 The graduation ceremony for students of second-cycle English-language programs was held this March 14 at the Runge Collegium of the Poznań University of Life Sciences. The event was attended by: professor Jan Pikul, Ph.D., His Magnificence Rector of the Poznań University of Life Sciences; professor Cezary Mądrzak, Ph.D., Deputy Rector in charge of Studies; professor Krzysztof Szoszkiewicz, Ph.D., Deputy Rector in charge of Science and International Cooperation; professor Piotr Ślósarz, Ph.D., Dean of the Faculty of Veterinary Medicine and Animal Science; Bożena Danyluk, Ph.D., Dean of the Faculty of Food Sciences and Nutrition; Tomasz Kosiada, Ph.D., Dean of the Faculty of Horticulture and Landscape Architecture; and professor Jean Diatta, Ph.D., Representative of the Rector in charge of Cooperation with African Countries. Professor Michael Sadowsky from the University of Minnesota attended the ceremony as a special guest. Diplomas were delivered to 20 students of three English-language majors: Animal Science, specialization in Animal Production Management (Faculty of Veterinary Medicine and Animal Science), Horticulture, specialization in Plant Breeding, Seed Science and Technology (Faculty of Horticulture and Landscape Architecture) and Seed Science and Technology, Food Science and Nutrition (Faculty of Food Sciences and Nutrition). The students originate from almost all continents, including such countries as Bangladesh, China, Ghana, India, Jamaica, Nigeria, Turkey and United States. Congratulations to the graduates!